Computers for the over 40's: BRAAIIINNSSSS! "MY GOD - I DON'T UNDERSTAND ANY OF THIS GARBAGE! DAMN YOU! DAMN YOU ALL TO HELLLLLL!" Sempron II - least powerful and oldest. 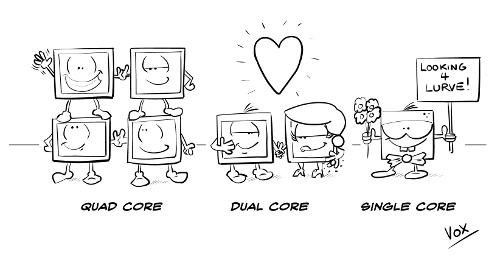 Cores: In computing terms, a "core" is one logical processor. Years ago (back in the 90's) all CPU's had one single core. As technology has progressed, the CPU designs have evolved and many now contain more than one logical processor in their physical CPU chip (For example, i7 CPU's can have 4 logical processors) - the advantage of this is "hyper threading" - that is, having the computer run more than one task simultaneously, with no performance hit (older CPU's can't do this). 1. Buy an Intel based chip. There's nothing wrong with AMD chips (I've used lots of them in the past, and they're great), but Microsoft work hand-in-glove with Intel, which means that Windows will not only be better supported, but will run better too..